During Main Street Delaware’s First Friday on Jan. 5, the Delaware County District Library will unveil the new bookmobile. 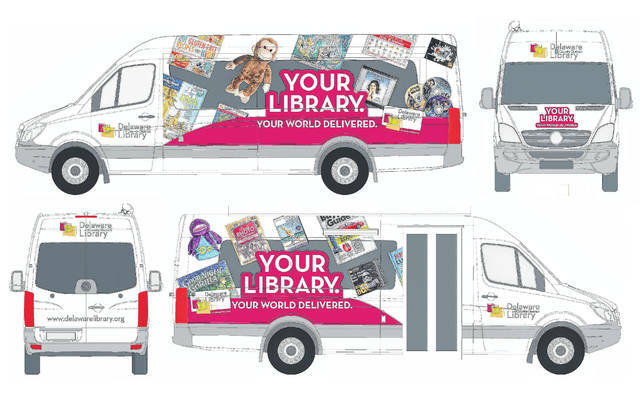 The illustrations provided by the Delaware County District Library show all four sides of the new vehicle’s exterior custom graphics. While the good folks at the Delaware County District Library don’t don capes, cowls, or nifty utility belts like a certain dark knight, they do have a super vehicle that they use to help local book-lovers. And during Main Street Delaware’s First Friday on Jan. 5, the Delaware County District Library will unveil its new bookmobile. The old bookmobile is being retired after 16 years of service and with more than 106,000 miles collected from traveling the roads of Delaware County. The district’s Outreach Services Department expands the library’s reach to its patrons by taking books, DVDs and other library materials to individuals, preschools, daycare centers, and senior citizen centers. The new bookmobile is a 2017 Sprinter designed and manufactured by Farber Specialty Vehicles of Reynoldsburg, Ohio. According to a press release from the district, the new vehicle is 24 feet in length and features the best fuel economy in its class. It has “full-height electronically operated bus doors” for patron entry, walls lined with shelving, eight removable carts, and a lift for visiting patrons or the loading and unloading of book carts. The new vehicle’s equipment list includes a workstation with a wireless signal booster for remote checkouts, a public address system, and a retractable awning for public events like the Touch-A-Truck program. In a previous interview, Apt said the bookmobile is loaded the day before with everything needed for each of the stops the next day. She said the bookmobile makes stops in Radnor, a few north of Delaware city and at Delaware State Park. Then it goes back down to the Columbus city line in the southern part of the county. The bookmobile usually leaves around 8:30 a.m. each day and it currently travels approximately 500 miles each month. Keeping the bookmobile stocked and running requires the work of seven people and a large back room at the Orange Branch. Apt said the large room is the place where staff pulls and organizes the books and materials for the approximately 450 patrons it sees each month. She said on the new bookmobile, once carts come off patrons can walk onto the vehicle at one end and exit at the opposite end once they make their selections. Apt said staff currently rolls 13 carts of books off of the old bookmobile at each stop and then rolls them back on just before departure. The new bookmobile will be open to the public from 6 to 9 p.m. on First Friday, parked outside the Delaware Area Chamber of Commerce offices. This entry was tagged bookmobile, Delaware County District Library, Downtown Main Street, Robbie Apt. Bookmark the permalink.